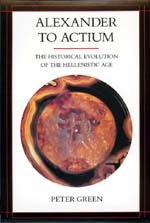 The Hellenistic Age, the three extraordinary centuries from the death of Alexander in 323 B. C. to Octavian's final defeat of Antony and Cleopatra at the Battle of Actium, has offered a rich and variegated field of exploration for historians, philosophers, economists, and literary critics. Yet few scholars have attempted the daunting task of seeing the period whole, of refracting its achievements and reception through the lens of a single critical mind. Alexander to Actium was conceived and written to fill that gap. In this monumental work, Peter Green—noted scholar, writer, and critic—breaks with the traditional practice of dividing the Hellenistic world into discrete, repetitious studies of Seleucids, Ptolemies, Antigonids, and Attalids. He instead treats these successor kingdoms as a single, evolving, interrelated continuum. The result clarifies the political picture as never before. With the help of over 200 illustrations, Green surveys every significant aspect of Hellenistic cultural development, from mathematics to medicine, from philosophy to religion, from literature to the visual arts. Green offers a particularly trenchant analysis of what has been seen as the conscious dissemination in the East of Hellenistic culture, and finds it largely a myth fueled by Victorian scholars seeking justification for a no longer morally respectable imperialism. His work leaves us with a final impression of the Hellenistic Age as a world with haunting and disturbing resemblances to our own. This lively, personal survey of a period as colorful as it is complex will fascinate the general reader no less than students and scholars. Peter Green is Dougherty Centennial Professor of Classics at the University of Texas at Austin. A novelist and translator as well as a scholar, he is the author of many books, including The Laughter of Aphrodite: A Novel about Sappho of Lesbos (California, 1993).